The footage of the Kuban Cossack Chorus's performance at the wedding of Austrian Foreign Minister Karin Kneissl, which was attended by Russian President Vladimir Putin on Saturday, has been released. 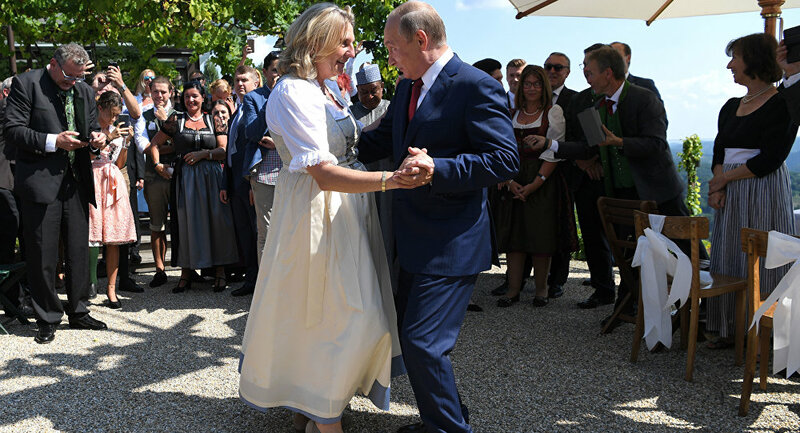 The video, in particular, showed Putin dancing with Kneissl to the accompaniment of the world famous Last Waltz ballad, performed by one of the leading folkloric ensembles in Russia. In the footage Putin is also seen congratulating the newlyweds in German. Commenting on the wedding ahead of his talks with German Chancellor Angela Merkel later on Saturday, the Russian president described it as "a private visit" and "a good and very warm-hearted trip."